RICHMOND, Calif. – The Chicago Bulls are expected to pursue Carmelo Anthony in free agency. They just shouldn't expect Derrick Rose to participate in the recruiting. Rose told Yahoo Sports on Sunday that he doesn't plan to recruit Anthony – or any free agent, for that matter – even though he likes Anthony's game and thinks they can play alongside each other. Rose's reason is simple: He said it's "not my job." "My thing is if they want to come, they can come," Rose said. Anthony averaged 27.4 points for the New York Knicks last season. Rose averaged 21.8 points and 7.9 assists during the 2011-12 season – the last before he injured his left knee in the 2012 playoffs. Rose respects Anthony's game and believes they can co-exist. "I love Melo's game," Rose said. "He's a great player. Takes the game serious. He's consistent. He shoots the ball great. I love his heart. "I can play with anybody, no matter who it is. I believe I can play with anyone if they step on the court with me." As for when Rose will resume playing, he told Yahoo Sports he expects to be ready for the 2014-15 NBA season-opener, but has yet to decide if he will try out for USA Basketball's World Cup team this summer. Rose has played in only 10 total games the past two seasons and 50 the past three because of various injuries, including two major knee surgeries. He said he has been taking part in five-on-five scrimmages for a while and his rehabilitation is going well. But Rose also said he is uncertain if he will participate in USA Basketball's training camp starting July 28 in Las Vegas. "I still don't know yet," Rose told Yahoo Sports at the Drew Gooden Foundation Basketball Camp on Sunday. "If I'm feeling right and the time is [right], for sure I will go out there. My body is responding good, but you never know. "Right now, I haven't really thought about that. I am just worrying about just trying to get back every day and I'm really taking rehab one day at a time instead of trying to think about competing." The United States will begin playing in the World Cup in Spain on Aug. 30 and the gold medal game is Sept. 14. If Rose doesn't play, USA Basketball's 2014-16 28-man roster pool is still loaded with point guards that include Chris Paul, Deron Williams, Russell Westbrook, Damian Lillard, Kyrie Irving and Stephen Curry. Westbrook, Lillard, Irving and Curry are expected to try out for the World Cup team. USA Basketball chairman Jerry Colangelo is expected to begin reaching out to players in early July. USA Basketball will also have a training camp in Rose's native Chicago from Aug. 14-15 and play Brazil in an exhibition game on Aug. 16 at the United Center. Rose last played in a game for the Bulls on Nov. 22 and last played in the United Center in Chicago on Nov. 18. Rose said it would be fun to play for the U.S. in Chicago, but he's more focused on his rehabilitation. He said his national team decision will be made between himself and his agent, B.J. Armstrong. "If we both agree on it, we're good. If not, there is nothing wrong with saying no," Rose said. Rose has been playing five-on-five for about 45 days and Bulls coach Tom Thibodeau recently said Rose was increasing the intensity of his workouts. Rose is certain he will be in uniform for the Bulls' opener. "For sure. That's not a concern," Rose said. "I'm on a mission. I'm just trying to get better. I'm taking it day by day. I'm getting the best out of every day." 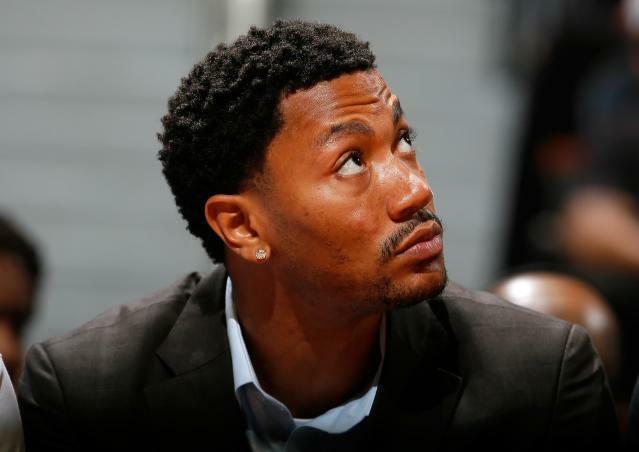 Asked to grade the strength of his knee, Rose said, "I want it to be a surprise. I want people to see me. It's going to be a surprise." Rose flew to the Bay Area for one day to make a surprise appearance at the camp hosted by Gooden, his former Bulls teammate. He spent about 10 minutes talking to and taking questions from the kids in attendance. He next spent another 20 minutes patiently signing autographs and taking pictures with kids and adults in attendance at the Booker T. Anderson Community Center. Before Rose departed, the kids began chanting, "MVP! MVP!" Rose hopes to be playing at that level next season. "I think I was ready a long time ago," Rose said. "Right now is about just getting all the wrinkles out. I've been playing for a long time, even though nobody has [seen it]. I want to just step on the court and I want people to see that I'm the same."